First impressions have a lasting influence. That’s why it’s important that neighborhood business districts present an appealing image to potential customers, tenants, and investors. The Facade Improvement Program is a tool to improve the physical appearance of commercial storefronts in the Mt. Oliver Business District, while promoting place-making and thoughtful design throughout the corridor. 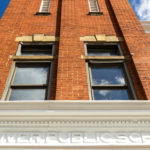 Eligible activities include exterior building improvements based on an approved work plan such as storefront lighting, signage, windows, painting, etc. This program can fund up to 75% of eligible improvements, with a maximum grant award of $7,500. Starting a new businesses can be risky. To help minimize that risk, the economic development team has implemented a Rent Abatement Program that could subsidize up to 50% of the rent for qualified businesses – just another incentive for starting or moving your business to Mt. Oliver Borough. The University of Pittsburgh Small Business Development Center (Pitt SBDC) is free resource that provides support for businesses of all sizes and stages. Whether you are just starting out or expanding an already successful enterprise, Pitt SBDC offers many workshops, as well as no-cost, one-on-one consulting services to help establish and grow your business. Kiva is an international non-profit that provides no-interest loans to small businesses through crowd funding.